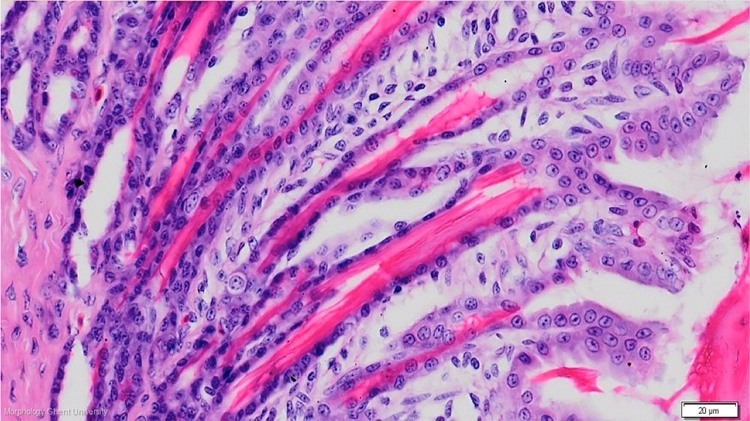 The lining surface epithelium is a single cuboidal to low columnar epithelium. The cells accumulate small granules with mucous content in their apical part of which secretion sometimes can be seen as a clear bleb projecting into the lumen of the pit. The glands contain two main types of cells: most abundant are the chief cells while at the fundus of each gland only two to three basal cells can be found. Chief cells at the base of the gland are cuboidal to low columnar in shape with dark, rounded nuclei. In the middle part they become more flattened and the nuclei are oval shaped. Chief cells produce the main part of the koilin. They stain basophilic, especially in their basal part because of a well-developed rough endoplasmatic reticulum and numerous free ribosomes. In their apical part, eosinophilic secretory granules can be found. The basal cells have a cuboidal shape, a large, round pale nucleus and a pale-staining cytoplasm.